A veteran Russian Cosmonaut and two NASA Astronauts will barrel through a blaze of fire Sunday morning aboard their Soyuz MS-04 spacecraft, aiming for a parachute-and-rocket-assisted landing on the steppe of Kazakhstan to conclude a space flight of 136 days for Soyuz Commander Fyodor Yurchikhin and NASA’s Jack Fischer and a 289-day mission for record-holder Peggy Whitson who is returning from her third long-duration mission. 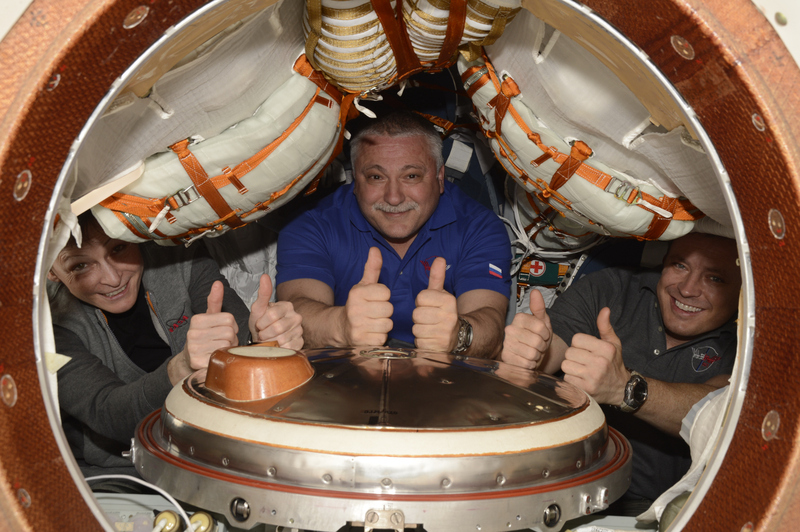 It will be an eventful Saturday night for the returning crew trio, sealing themselves off aboard their Soyuz spacecraft at 18:40 UTC to gear up for undocking from the International Space Station at 21:58 UTC. Soyuz will circle the Earth one and a half times before firing up on a rocket-powered braking maneuver at 0:29 UTC on Sunday that will put the craft and its three crew members on an arc intercepting Earth’s atmosphere over the Middle East, en-route to an early morning landing. 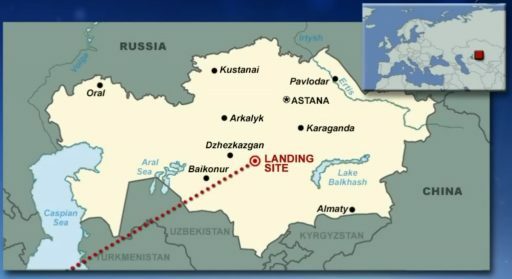 Descending under its large orange-and-white parachute, Soyuz is expected to land in a remote location in south-central Kazakhstan at 1:22 UTC, just half an hour after sunrise. Soyuz MS-04 lifted off from the Baikonur Cosmodrome on April 20 with fifth-time space flier Fyodor Yurchikhin in the commander’s seat, rookie NASA Astronaut Jack Fischer in the left seat and a cargo container in the right seat, marking the first two-person Soyuz launch since April 2003. This was the result of a Roscosmos decision to cut the Russian crew complement on ISS to two due to work load requirements on the Russian segment and a desire to reduce costs until the Nauka multipurpose laboratory module can be added to the Station. 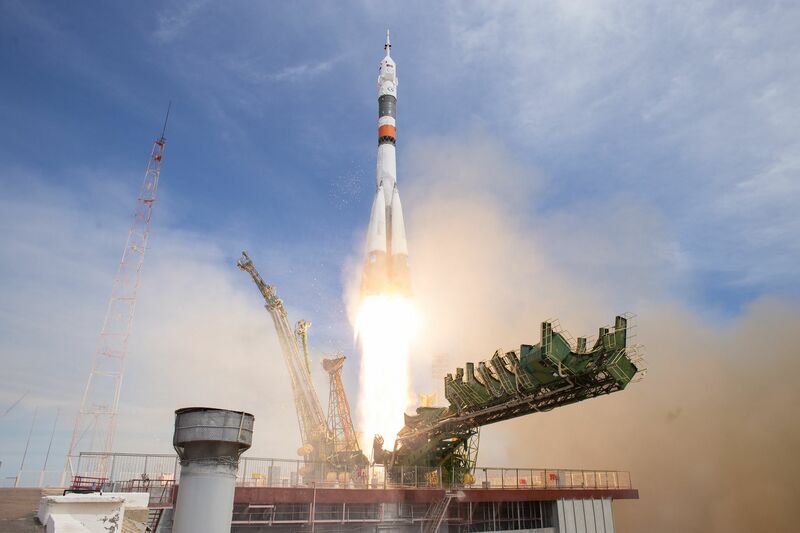 Soyuz MS-04 lifted off one month after its originally scheduled launch date because the Soyuz #734 spacecraft that was planned to fly the mission had to be replaced by the next vehicle in line due to a leak on its thermal control system. Consequently, Soyuz #735 was brought forward and readied for launch on the MS-04 mission. The next mission, Soyuz MS-05, suffered a knock-on effect, ending up slipping two months because of processing time needed on the #736 Soyuz that was brought forward from the MS-06 mission. Yurchikhin and Fischer arrived at ISS just over six hours after lifting off, joining the Expedition 50/51 crew members Peggy Whitson, Oleg Novitskiy and Thomas Pesquet who had been onboard ISS since November 19. The open seat on the Soyuz MS-04 craft provided an interesting opportunity for NASA to shift one USOS crew member from the MS-03 craft to the MS-04 vehicle and keep an extra pair of hands on ISS through the summer when the Station was facing an extended period of two-crew operations due to the two-month delay to the Soyuz MS-05 mission. NASA decided to keep ISS & Soyuz veteran Peggy Whitson on the Station for an additional three months after Roscosmos provided the green light for her switch from MS-03 to the MS-04 spacecraft. Whitson was the perfect candidate for the extended mission as she had been in the running for the first year-long Expedition to ISS in 2015/16 that ended up being performed by Scott Kelly and Mikhail Kornienko. Switching crew members between Soyuz craft has been commonplace when the Space Shuttle was still in operation and only requires the crew member’s custom-made Kazbek seat liner to be swapped and adjustments to the seat fit, ensuring proper protection for when Soyuz makes a noticeable return to Terra Firma. 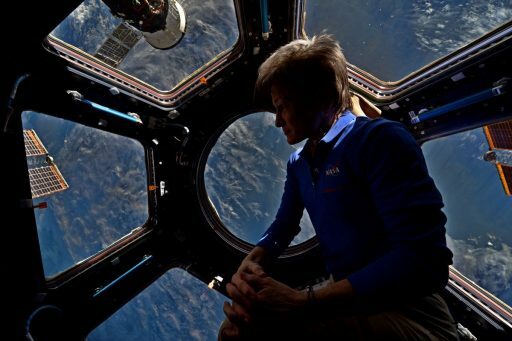 On April 24, Peggy Whitson broke the record for the longest amount of time spent in space by any NASA astronaut, surpassing Jeff Williams who raked up 534 days off the planet on three long-duration ISS Expeditions. 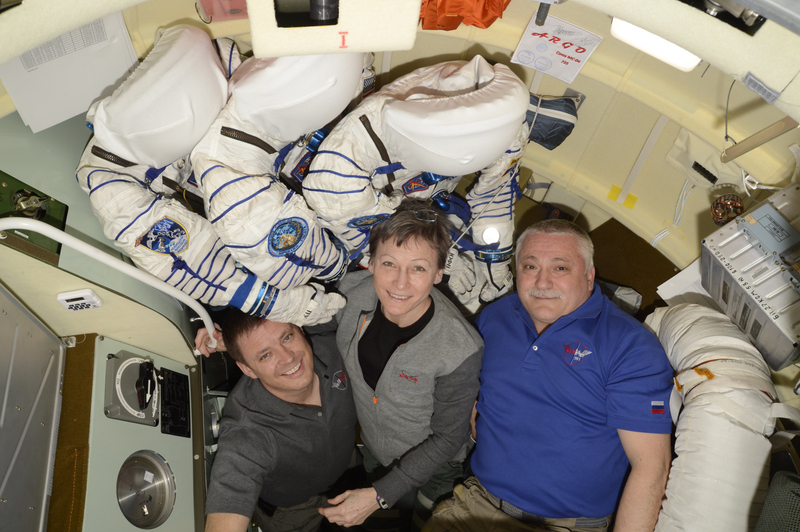 Whitson officially transferred to the Soyuz MS-04 crew in May when her Kazbek seat liner was moved into the right seat of the ‘Argo’ spacecraft. Peggy Whitson’s original crew of Oleg Novitskiy and Thomas Pesquet made a safe return to Earth, touching down at sunset on June 2nd to close out an extended mission of 197 days to shorten the reduced crew period between the MS-03 landing and MS-05 launch. Heading into her extended mission, Whitson passed Samantha Cristoforetti’s record for the longest single space flight by a woman at the 200-day mark. Landing on Sunday, Peggy Whitson will have spent 289 days and 5 hours in space as part of ISS Expeditions 50, 51 and 52, bringing her cumulative total time spent in space to 665 days and 23 hours – ranking eighth on the all-time list. Her 289-day mission will put her in seventh position for the longest human space flights to date. Adding another four EVAs to her record, Whitson now ranks third with ten excursions for a total of 60 hours and 21 minutes. Peggy Whitson saw ISS during one of its busiest periods to date with hundreds of experiments in progress during her tenure as well as continuing efforts to ready the complex for the start of Commercial Crew missions and revamp the Station’s systems to keep it running at full capacity heading into its last decade of operations. Highlights of her nine-and-a-half-month mission include an extensive human-and-robotic collaboration in January 2017 to replace the first batch of batteries on the Station’s external truss, the relocation of Pressurized Mating Adapter 3 to a position where it can welcome arriving Starliner and Dragon spacecraft, eight cargo vehicles arriving & departing ISS, and a total of seven EVAs performed on both sides of ISS. With their mission winding down, the three departing ISS crew members began packing their spacecraft for return – placing trash into the Orbital Module that will be discarded for a fiery re-entry and stowing various samples, hard drives and other return items in the small Entry Module. Sokol suit fit and leak checks as well as landing simulations were on the crew’s schedule in August and Soyuz MS-04 underwent an external inspection via the Station’s new HD cameras and a detailed systems check was run on the spacecraft. Expedition 52 Commander Fyodor Yurchikhin will hand over command of ISS to NASA Astronaut Randy Bresnik on Friday who will be at the helm for Expedition 53, joined by Sergey Ryazanskiy and Paolo Nespoli. The crew will be able to rest up on Saturday and have a last meal in space as a six-person crew before the departing crew members will head into final power-up on their Soyuz, receive an updated return timeline and move into hatch closure operations. Once hatches on both sides of the interface are closed, the crew will command the vestibule area between the Poisk module and Soyuz to depressurize for an hour of leak checks. While keeping an eye on pressure measurements, the returning crew members will put on their Sokol Launch and Entry Suits and close out the Orbital Module by tying down loose items and deactivating systems. For landing, Yurchikhin will again be in the center seat with Fischer to his left and Whitson will sub-in for the payload container that accompanied the two men at launch. Once in their seats, the crew will complete leak checks on their suits, verify the integrity of the internal Soyuz hatch and press into final flight control system setup. Hooks on the Poisk Module will open up well ahead of undocking so that Soyuz is only held in place by its own hooks. The docking mechanism will power up five minutes prior to undocking and the Space Station will move into a Fine Attitude Hold mode with thrusters disabled to be as still as possible for the demating sequence. 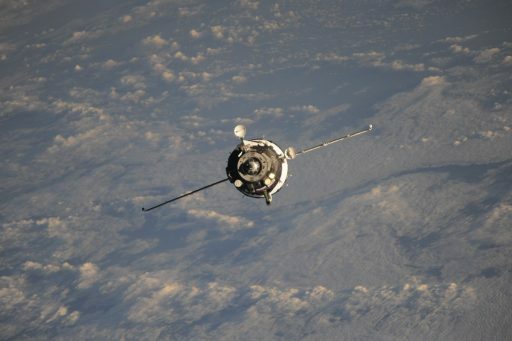 The undocking command will be issued 90 seconds prior to the target undocking time of 21:58 UTC to enable the hooks to open and break the structural connection between Soyuz and ISS that was in place for close to 136 days. When hooks are open, loaded springs will push off ISS with 300 Kilogram-force, initiating a slow opening rate of 0.1 meter per second. Slowly drifting away from ISS, Soyuz MS-04 will enable active thruster control but remain in a passive state for three minutes to open up a sufficient gap for the first of two departure maneuvers. The eight-second firing of the craft’s DPO thrusters will accelerate the opening rate along the Station’s R-Bar or radial vector in the new departure architecture that avoids a re-orientation of ISS to save precious propellant. 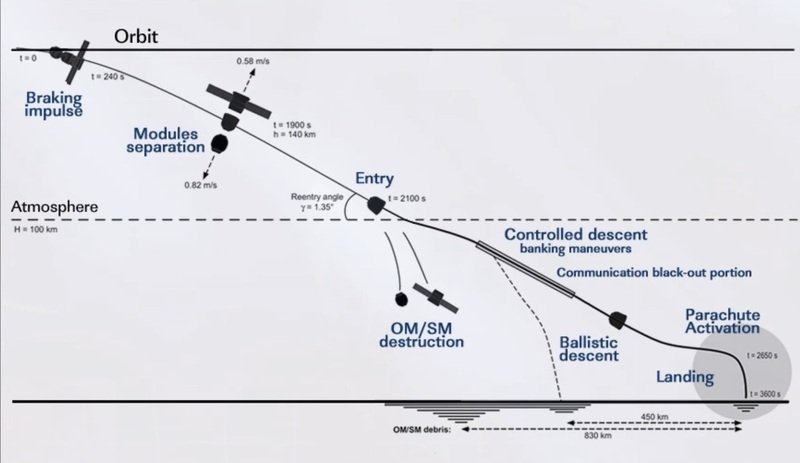 A second, longer departure burn of thirty seconds will occur after a fast re-orientation by the Soyuz to deliver a thrust component along the velocity vector. 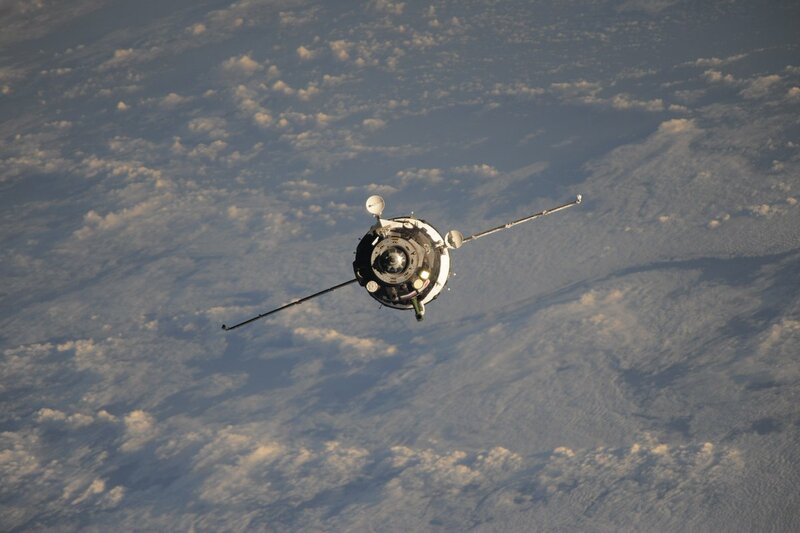 Departing the Station along the velocity vector, Soyuz will enter two and a half hours of free flight to open a gap of around 12 Kilometers prior to the deorbit burn. Soyuz will flip into a tail-first orientation and open up a protective cover shielding the SKD propulsion system to clear the way for ignition of the 300 Kilogram-force S5.80 main engine at 00:29 UTC on a burn of 4 minutes and 37 seconds. Hitting the brakes, Soyuz will slow down by 128 meters per second to transition from an orbital trajectory to a sub-orbital path that intercepts the atmosphere at a precise location to enable Soyuz to land in Kazakhstan. Upon completion of the critical deorbit burn, the crew will close their helmets and the Orbital Module will open a valve to vent down to the vacuum of space to set up for the pyrotechnic separation of the three sections of the Soyuz once crossing 140 Kilometers in altitude, passing over the Red Sea on a north-easterly heading. With the Orbital and Service Modules on their way toward a destructive entry, the Entry Module will fire up its thrusters to face its heat shield forward in preparation for Entry Interface at 0:59 UTC as it descends through 100 Kilometers over the border of Iraq and Iran – starting the 23-minute process of slowing down from 7.6 Kilometers per second to a complete stop. The Entry Module will stick to a pre-programmed orientation for the first minute and a half of re-entry before pressing into active guidance to take the spacecraft through a series of bank maneuvers to bleed off energy while also controlling its downrange travel distance by modifying lift. Blazing through the atmosphere, Soyuz will be immersed in plasma with its windows glowing bright yellow and the heat shield slowly burning away to fulfill its function of creating a boundary layer between the spacecraft and the extremely hot shockwave layer of crushed air in front of the capsule. Emerging from the plasma, the crew will pull up to five Gs when passing through 35 Kilometers in altitude, decelerating rapidly toward the planned parachute opening point. Soyuz slows to a speed of around 210 meters per second for the opening of the parachutes 10.8 Kilometers in altitude – starting with a pair of Pilot Chutes that are ejected to pull out the larger Drogue Chute that will be tasked with slowing the vehicle from 0.7 times the speed of sound to around 80 meters per second. As Soyuz passes 7.5 Kilometers in altitude, the large orange-and-white main chute will unfold to further slow the spacecraft and put it into a vertical descent toward the landing point. The automated landing program – starting around 5.5km in altitude – takes the Soyuz through a final series of steps to get ready for touchdown, dropping the heat shield to expose the landing thrusters and altimeter, re-hooking the spacecraft to a symmetrical arrangement under the chute, jettisoning the blackened window covers and equalizing the cabin pressure. 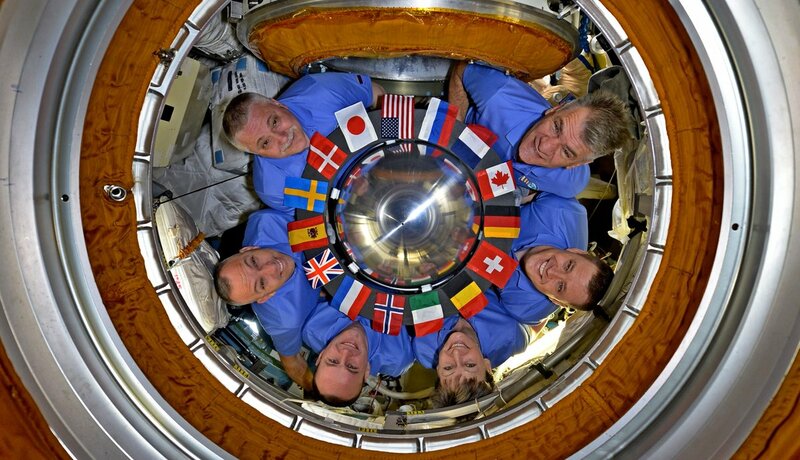 By that point, the crew will be keeping their heads down in anticipation of the great finale of their return to Earth. 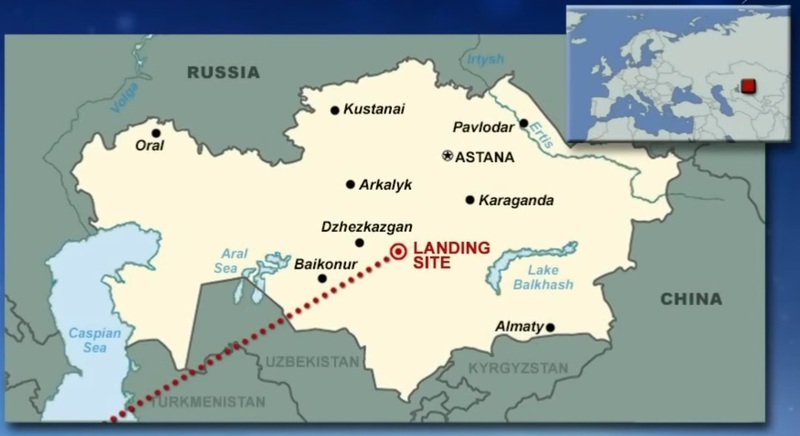 Touchdown is expected at 1:22 UTC in the Southern Landing Zone located 148 Kilometers south-east of the town of Dzhezkazgan. 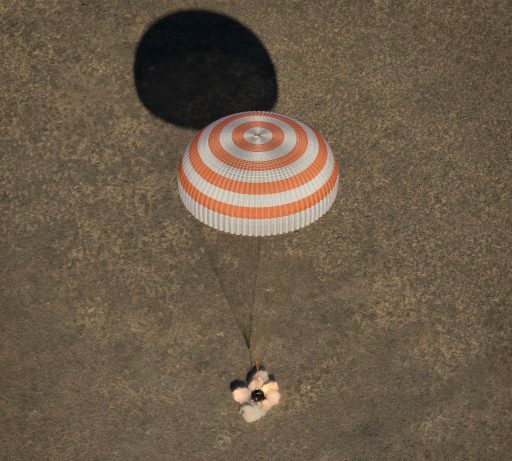 Recovery forces in helicopters and ground-based vehicles will begin descending on the landing site to assist the returned crew members out of their capsule to be then seated in reclining chairs for a breath of fresh morning air after their return.